Financing tournaments, consistent play are 2 of biggest challenges Madison native faces. Seth Sweet knows he can compete with everybody on the minor league golf tours that crisscross the Southeast. Here’s the thing: When Sweet is on the course, playing in one of those tournaments, it feels exactly as if everybody is doing it. “There’s so many guys who think they can make it,” Sweet said in a phone interview Thursday afternoon. Sweet graduated from Old Dominion University 14 months ago. A Madison native, Sweet won a pair of individual state titles in high school as well as the 2012 Maine Amateur championship before a successful four-year collegiate career with the Monarchs. Last August, Sweet won his final amateur tournament, the Hilton Head Open in Hilton Head, South Carolina. Sweet went to Florida to begin playing professional tournaments. Sweet’s first tournament was the Palm Beach Turkey Classic in November. He shot a respectable 72, just nine strokes off the winner, Steve LeBrun, who tied the course record 63. LeBrun won just over $1,000. Sweet won nothing. A week and a half later, Sweet played in the Minor League Golf tour championship at Abacoa Golf Club in Jupiter, Florida. Sweet finished in a six-way tie for 32nd place and won $110. According to stats available on minorleaguegolf.com, Sweet played in eight tournaments between November and February. His best finish was a ninth-place tie in the WPB January Open. In those eight tournaments, Sweet won $359.75. “I played well in some tournaments. Those guys are really, really good,” Sweet said. The problem isn’t the level of competition, Sweet said. After a few rounds, he knew he could play against anybody in the field. The problem, he said, is trying to finance playing on your own. The first tournament he played had an entry fee of $700, Sweet said. Then factor in a hotel room and meals. There was another tournament in which Sweet played two days in pouring rain. Still, he played well and shot 8-under par. His share of the purse was $66, Sweet said. The winner came in 11-under par, just three strokes ahead of Sweet, and took home $3,000. With the difference in winning a big payday or a little more than gas money a putt here or an approach shot there, playing consistently well is necessary. “With the mini tours, it’s so hard to do it on your own. You’ve got to finish in the top five every week against 100 other guys just as good as you just so you can make a little money,” Sweet said. 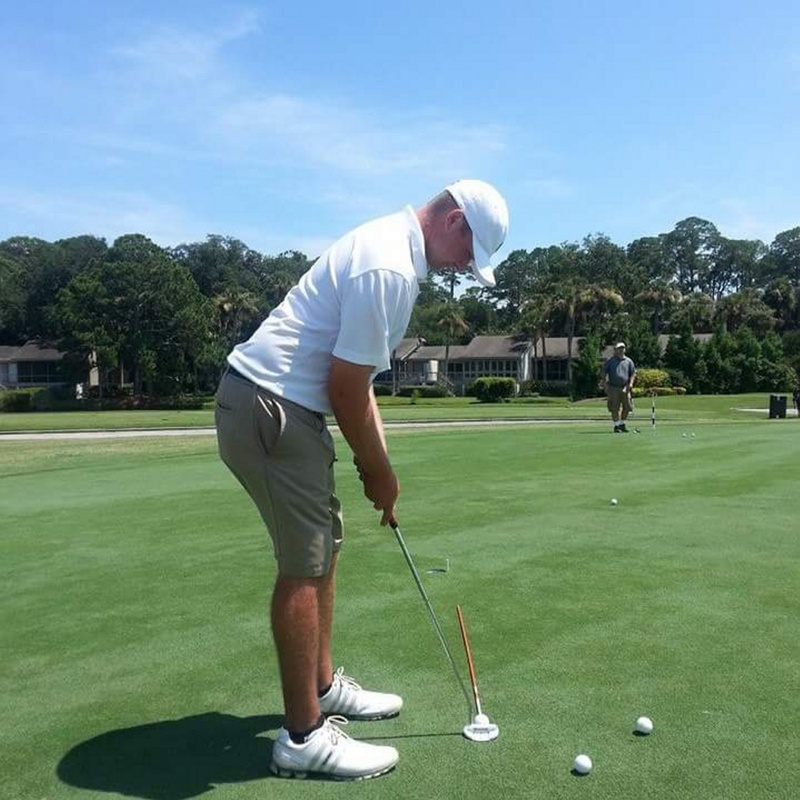 Now, Sweet is in Beaufort, South Carolina, working at Secession Golf Club as a playing pro. Sweet’s job title is an apt description of his duties. The members of the club are good golfers, he said, and they want a club pro who will challenge them on the course. There’s also the chance some members could sponsor Sweet in some tournaments, hoping if he plays well it will reflect well on the club. Sweet recently played in a pair of tournaments, the South Carolina Open in late May and the North Carolina Open a few weeks ago. He tied for 31st place in the South Carolina Open. In North Carolina, he had more success, tying for 10th and winning $955. Sweet felt he left some shots on the course. “I didn’t play particularly well,” he said. Sweet plans on entering Q school tournaments this fall to try and earn a spot on the Web.com Tour, a top feeder tour to the PGA Tour. Just 22 years old, Sweet knows he has time to give professional golf a full try.